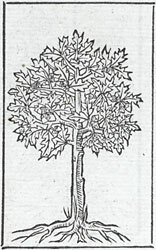 Alciato at Glasgow: Emblem: Ilex. Because the holm-oak splits spontaneously through excessive inflexibility, it provides symbols for civic discord. 1. Duritie nimia, ‘excessive inflexibility’. Cf. Pliny, Natural History, 16.73.186 (tota ossea est ilex, ‘the holm-oak is entirely bone-like’).